Life. Work. Birth. Death. And everything in between. Read on. I wrote some time ago about the process of writing. Unless I’m writing for myself – that is, when I had time for ‘recreational writing’, or even blogging for that matter – I tend to procrastinate. I sit in front of the monitor surrounded by swathes of research, I huff and I puff, I put my head in my hands, I wander off, stroke the cats, make a cup of tea, sit in the garden staring at a bush. I repeat this a few times, then, after the first paragraph or two, it’s there, in my head. I totally know where it’s going and what I’m doing and before I know it, the piece is written. This hasn’t changed, and it’s telling me that it’s an essential part of the process. You need that time to fulminate. To ruminate. To think. People don’t pay you to think, but it is necessary. Then you become so familiar with something you just want rid of it. Then you look back on it a few weeks or months or years later, and you’re pretty pleased with what you did. It was all worth it in the end. The more I work in other fields, the more I think this is a universal process. I’m going to call it the UP™. An example: I used to be into home-based music production. It was a phase, albeit a fairly long one (about 8 years – you can hear the results here). The same would happen. I’d noodle a fair amount, then suddenly latch onto it and off I went. Then I would spend a very, very long time with the production. In the end, same thing: I had enough. But it had to be finished. So I would end up finishing it without really knowing if it was finished. And sometimes I listen to it even now and I quite like it. Does that make sense? Another example: today, I put together a Facebook page for a client. I’ve done this before, but every client is different, and you pretty much find yourself starting from scratch every time. At first I was fairly overwhelmed. There were so many wrong ways to go about it, and I had to find the right way. So I looked through all the content I had – several times – then did some research about best practice, looked at what other people had done, etc etc. There was huffing and there was puffing, there was head in hands. There were cats stroked. Bushes were looked at. Tea was drunk. About two hours later I was absolutely heading in the right direction. And now I’m really getting into it. And I thoroughly expect that, after we launch and promote it (and keep promoting it for the next few months) I will have had enough of it, and want to do something else instead. But I’m hoping the client will like it. And I’m hoping I’ll look back on it and like it too. Copywriting, music, social media (and, for that matter, design and code, which is what I’m doing with the FB page). They all follow this pattern. Even research. I hate starting a social media audit. I love it when the figures come out. I hate having to keep plugging away and updating it. I love it when I look back and think I did a good job. This process needs a model. 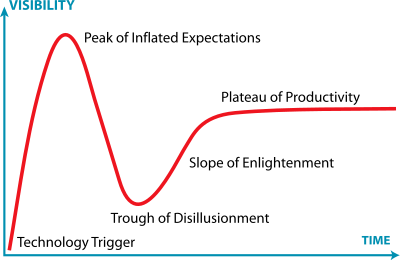 I like the Gartner Hype Cycle. I like its categories: the Trigger, the Peak of Inflated Expectations, the Trough of Disillusionment, the Slope of Enlightenment and finally the Plateau of Productivity. See below. I think that applies to work, too, but with a different shape. My new categories? The Commission, the Trough of Despond, the upward Slope of Encouragement, the Peak of Productivity, the downward Slope of Dudgeon and finally, the Plateau of Reality. It’s the UP™. See below. Let’s be philosophical. I wonder if life is like this? In which case The Commission is when mummy and daddy got friendly, the Trough of Despond is when you realise you’re probably not going to get that Ferrari (or in my case a Morgan, although my Spitfire is seeing me alright), the Upward Slope of Encouragement is when you think “Well, that’s ok, let’s focus on what’s important”, the Peak of Productivity is after you climb up (or my case, up a bit, across a bit, down a bit) the career ladder and start really enjoying life, the Downward Slope of Dudgeon is when you start confusing your grandchildren’s names with the cats and hoovering the garden, and the Plateau of Reality is… well, I don’t think I’m there yet. I’ll post you when I am. Love it, Brendan: thinking of printing out and putting on the wall next to my desk! Do it! Make sure you get it the right way up though.